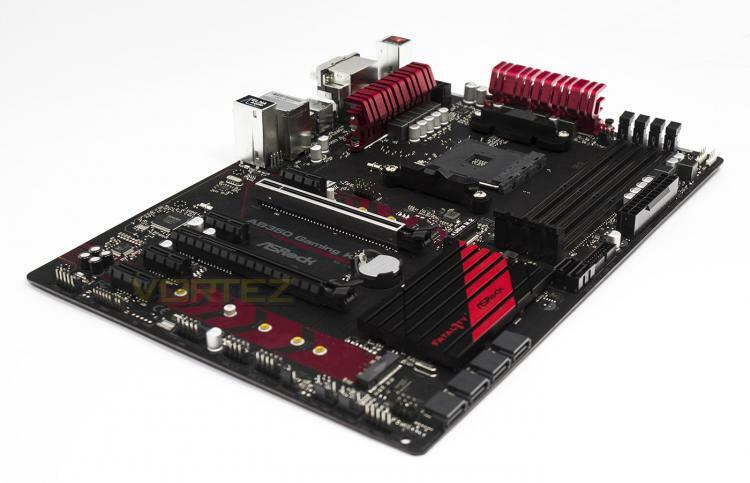 This motherboard represents ASRock's B350 gaming motherboard and competes against the likes of the MSI TOMAHAWK B350, and the GIGABYTE AB350 Gaming 3. The B350 chipset is an interesting inception, as it allows gamers to create a powerful system at a lower cost when compared to the X370 motherboards. The primary differences between the chipsets are: four fewer USB 3.1 Gen1, 2x SATA3 ports fewer, and no SLI support. With that in mind, if you don't plan on running a home server, or running more than one NVIDIA graphics card, a budget conscious gamer may want to consider a B350 motherboard. Amongst the trademark 'Super Alloy' technologies (thicker gold contacts on the DIMMs, steel slot, high density glass fabric PCB, 2oz copper PCB, and more), we can find some similarities between the Fatal1ty AB350 Gaming K4 and the GIGABYTE AB350 Gaming 3. For example, they both feature 6x SATA3 ports which is an additional two over what the chipset affords natively. To draw upon more comparisons, like on the TOMAHAWK B350, ASRock has given this board additional attention to the audio circuitry, featuring an isolated audio PCB, with dedicated PCBs for left/right audio channels, premium audio capacitors, and premium audio software (Sound Blaster Cinema 3). Another universal feature we noted is that each of these three examples only feature red LED lighting, and they have red coloured accents on the motherboard itself to varying degrees. Though what helps differentiate the ASRock AB350 Gaming K4 from the others is the inclusion of an additional M.2 slot. Though the additional M.2 slot shares bandwidth with the SATA3_3 port, this isn't a huge problem considering ASRock have included an additional 2x SATA ports anyway.